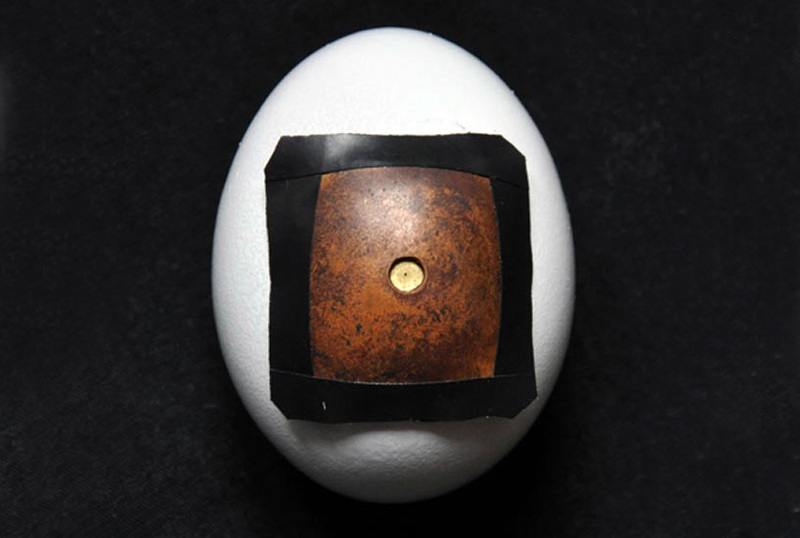 seeking to develop a camera that would be its own photograph, italian artist francesco capponi created the ‘pinhegg’, a pinhole camera composed of an emptied eggshell, which must be broken to reveal the image inside. to create the camera, capponi drilled a small square hole in the egg, washed it out, and coated the interior of the shell with photographic emulsion liquid, in order to make it light-sensitive. he recovered the opening by taping a wrought-brass plate to the exterior, and because of the translucency of the shell, wrapped the entire egg-camera in black cloth, with only the pinhole exposed. his photographic exposures lasted about thirty seconds, at which point he brought the camera to the darkroom, removed the pinhole plate, and filled the egg with processing and then fixing acid as with any photo development, revealing the image (as a photo negative) inside. he documents his process step-by-step in a lomography.com web tutorial. very beautiful; especially god and vitruvius, when inverted!